Ready for the Gathering in my fringed jacket. 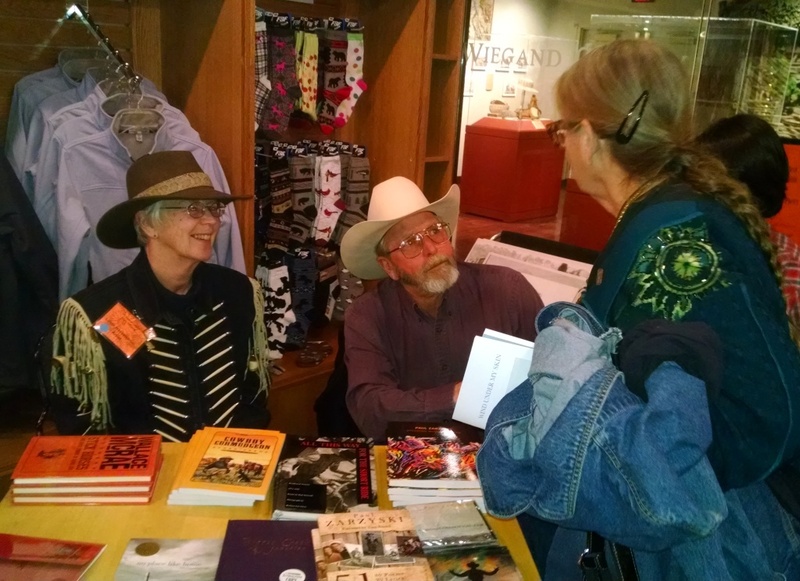 A week ago, on February 2, I arrived home from the 31st National Cowboy Poetry Gathering in Elko, NV, sponsored by the Western Folklife Center. A trek to the Gathering from South Dakota requires a serious investment of time; Elko is about 800 miles from Hermosa. 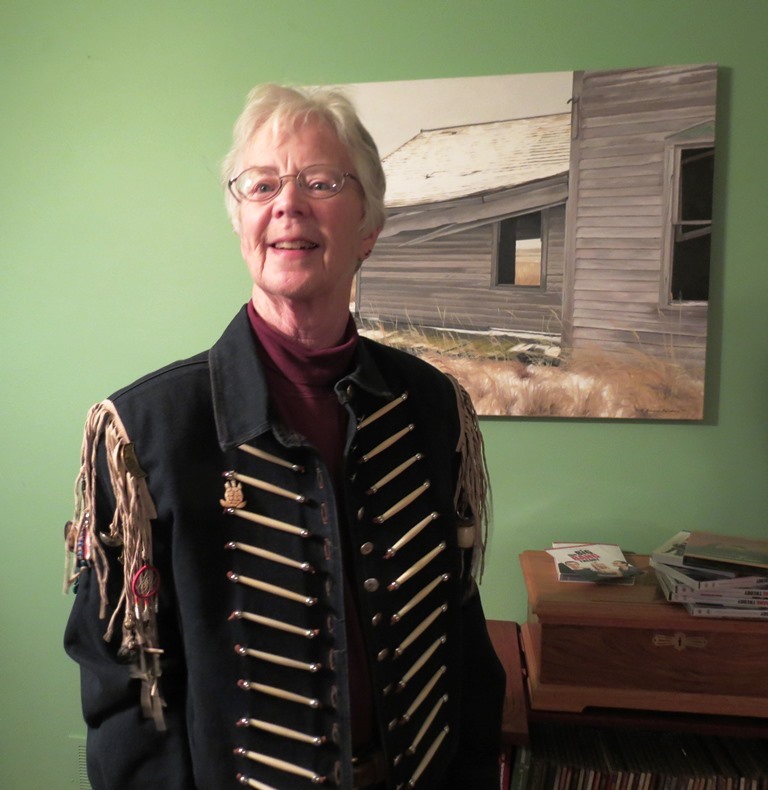 I left home Monday, January 26, to drive to Glendo, WY, to meet Nancy Curtis, who had agreed to drive from her home, and Yvonne Hollenbeck, who, like me, was an invited performer. I consider the financial compensation for this gig to be perfectly adequate, especially considering how poetry is valued in this country, but I suspect nobody goes to The National Cowboy Poetry Gathering just for the money. Boy, you must have gone crazy out there. Perfectly defines the attitude of a lot of folks about writing cowboy poetry! If I’m crazy I’m in good company. One night I sat under the spotlights on the stage of the G3Bar in the Western Folklife Center in the company of Wallace McRae, Paul Zarzyski and John Dofflemyer. I was marveling at the fact that 300 people had paid $30 or $35 each to hear us read and recite our poetry. No musicians, no other attractions shared the stage—just poets. But the audience doesn’t necessarily have to pay to hear the greatest cowboy poets and musicians in the nation. During every day of the Gathering, many sessions are free in the convention center. If you’d wandered into the Turquoise room last week, you could have spent an hour with me, John Dofflemyer, and Elizabeth Ebert, from Thunder Hawk, South Dakota, who was a closet poet until 1989. In 2005 when she was 80 years old, then-Governor Mike Rounds proclaimed February 24 as Elizabeth Ebert Day. (Learn more about her at www.cowboypoetry.com). Her work is hilarious, honest, and bone-deep true. Dames Don’t Dally, among many others. Or you could wander up to the high school building behind the convention center where volunteers kept the music going all day long– some of it open mic and some from respected and well-known musicians. One of the highlights of this gathering was listening to the music of Baja California Sur played by residents of that lonely place, who also set up an exhibit showing how they live. Besides all the poetry, there are sessions on a variety of other subjects. The early part of the week is usually devoted to workshops on writing, rawhide braiding, silversmithing, ranch tours, talks and discussions about conflicts between ranchers and others. Students from Owyhee Public School and other filmmakers worked on videos about the Deep West. One of my favorite musical events at this year’s gathering was watching Glenn Ohrlin, 88, play guitar and sing with Brigid Reedy, 14. The two shared a real joy of music, and it was a joy to watch them tease each other. Watching Glenn was painful, because he was so thin he looked like a walking skeleton, but his voice and mind were clear and strong, and he played beautifully. We heard that he drove to the Gathering with a passenger who was not happy with his driving. Ohrlin always preferred to travel by pickup truck. His rule was that if there was more than one way to get somewhere, he always took the road he’d never traveled, even if the distance was longer and the road narrower. Glenn lived in Mountain Home, Arkansas, where he operated a cattle ranch and lived in a stone house he’d built himself. As I finished writing today, I got word that Glenn has died. Nabhan quoted Aldo Leopold on a fact much of our society has forgotten, “People starve when land and water are degraded and forage declines.” But he had good news too: the market for grassfed beef is growing faster than that for any other commodity, as 60% of the farmers and ranchers in the U.S. have made changes in their methods that lead to better conservation of resources that belong to all of us. The Cowboy Poetry Gathering always features keynote speakers who challenge and enlighten. Another pleasure of going to Elko is eating Basque food available several places that originated with the Basque sheepherders of the region. My favorite meal this trip was a pork chop at the Toki Ona Basque Diner, accompanied by salad with a zingy dressing, soup, spaghetti, and Potatoes Ana. Our waitress, Kelly, happily described how to make Potatoes Ana, and I’ve made them twice since I got home. If I make them any more before July, I won’t be able to fit into my jeans. Another important part of the travel to the Gathering, at least the way I’ve done it fairly often since my first invitation in 1993, is the companionship of the trip. Driving can be a challenge, but it allows for long and deep conversations. Some of my best friendships have deepened and matured as we rolled along I-80, through Rawlins, Rock Springs, Evanston and the Three Sisters– the three long hills truckers hate. 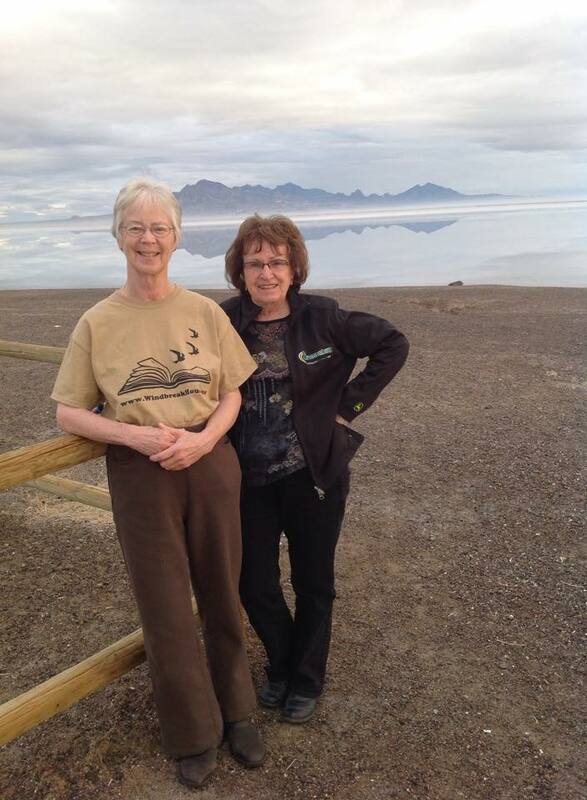 We slide through Salt Lake City and pass the great lake and wheel along the broad flats where travelers stop to arrange rocks in messages and symbols. In Wendover, Nevada, the casinos are always lit and very few people notice the shabby trailers and shacks housing the folks who keep those games spinning and those motel rooms clean. And then Elko, which I am told is surrounded by beautiful mountains and desert; I’ve rarely gotten outside the streets and sites of the various programs. And in Elko, we are hip by haunch with folks who come to hear cowboy poetry. In some cases, the clothes they are wearing would buy the ranches of the folks who are reciting on stage. I always admire the togs, but I’m there for the company of people who were writing about rural western life long before cowboy poetry began to attract crowds. As Badger Clark remarked, we just love “slingin’ ink and English” among other folks who understand the job that we’ve taken on: telling the truth about our rural western lives.